Where do I start to change my diet? What should I eat? How should I eat? What diet should I go on? Paleo, Vegan, Ketogenic Diet, Atkins, Zone, Mediterranean, Whole 30, Weight Watchers, Nutrisystem and others. The choices are confusing and mind boggling. What should I do? Let me be blunt: Sugar and Sitting cause most of the chronic diseases: Type 2 Diabetes, prediabetes, arterial disease, depression, dementia and a significant portion of cancer. One of the main issues with the idea of going on a diet is that eventually you will go off, and what happens then? With all due respect to my dietitian colleagues, the advice they must give to remain certified is perpetuating the problem. The aim is to change your view of food and how it fits into your life to benefit your health. Let me make this as simple as it was made for me when I was pushed into the first steps of my successful journey to lose 60# and cure my arterial disease and insulin resistance over nearly 6 years. We are seeing astounding results from this approach. This approach will work for most and harm nobody with the possible exception of people with Type 1 Diabetes. First, get a baseline body composition analysis. The initial results may frighten and depress you, but you can’t improve what you don’t measure. Turn fear and depression into motivation. Weighing alone is not adequate. You must know your muscle and fat mass, including your visceral fat. Visceral fat leads to diabetes and heart disease. You will be motivated as you see detailed measurable improvement. Drink more water. Your urine should be copious and clear. So you have to pee more? Deal with it! It is worth it! Don’t eat sugar. There is sugar added and hidden in every processed food. Avoid all processed foods. Avoid starches including bread, pasta, white potatoes and rice. Eat real food with no limits on vegetables including sweet potatoes. Limited amounts of fruit provide micronutrients and fiber, but come with sugar. Don’t juice! It removes fiber that makes the sugar in fruits absorb more slowly with less rise in insulin. Include good fats from olive oil, nuts, seeds, olives and avocados. Eat salmon and sardines, poultry and limited red meat, preferably grass fed and as organic as you can afford. Get connected, motivated and informed to support your changes. Stop analyzing the options and get started. You will love your results. As a traditional allopathic physician, I was trained to be skeptical about supplements. 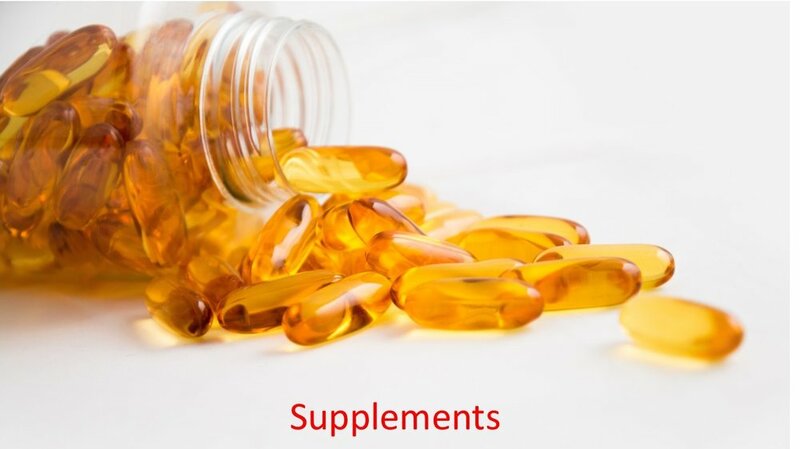 But there is evidence to support the use of supplements for specific purposes. As an unregulated industry, one should be careful about the source of any supplements you take. Choose products from companies that validate the content of their products by submitting to FDA monitoring for content. Look for evidence from clinical trials when they are available. Don’t rely solely on the recommendation of a friend who sells you a product and profits from that sale and engaging you, in turn, as a promoter of the product. And don’t hide the use of supplements from your physicians. They can interact with other drugs and influence your treatment. Here are the supplements we offer and their benefits. Our sale of Orthomolecular products is intended to assure that our patients get predictable benefit at a fair price. Our prices are intended to support their availability, not to generate a profit for the practice. Bergamot BPF: Extracted from the Bergamot lime with a special process, this capsule has been shown to have many of the beneficial effects of statins while also improving insulin sensitivity and reducing lipoprotein a. We recommend it primarily for those who don’t tolerate statins or prefer non pharmacologic treatments for arterial disease and hyperlipidemia. Niacin: Maligned by most physicians as adding side effects with no added benefit for the average patient, we know that most patients are not average. For those with elevated Lipoprotein a and small dense LDL dyslipidemia, there are benefits that make it worthwhile dealing with some annoying effects, including flushing. Using a high quality slow release product like Orthomolecular Niacin SR can minimize those effects. Flush free niacin is not effective because it is a different molecule. Vitamin D3 addresses our all too common deficiency of Vitamin D. “Normal” levels of >30 are not optimal. Our target is 50+. Toxicity is not a problem till above 100. Our preference is combining D3 with vitamin K2. K2 serves as a transport/binding agent for vitamin D that enhances its effectiveness. K2 also has potential arterial elasticity promoting properties. Diaxinol combines a number of agents that enhance insulin sensitivity (reduce insulin resistance.) Cinnamon is a lower cost alternative, but with the concentrated cinnamon extract and other agents in Diaxinol, we see more consistent improvement in measures that reflect insulin resistance. Fish Oil (Omega 3 fatty acids) acts to lower inflammation, reduces platelet adhesion and has several favorable effects on lipids. The goal is to get about 200 mg of combined DHA and EPA daily. Turmeric (curcumin) is a spice with anti-inflammatory benefits. Since atherosclerosis is an inflammatory disease, the potential benefits probably are worth considering. Vitamin E improves the arterial event risk in patients with Haptoglobin genotype 2-2, while increasing the risk for those whose genotype is 1-2. We stock and recommend natural alpha-tocopherol vitamin E 400 IU daily. Ubiquinol or CoEnzyme Q 10 mitigate statin muscle pain side effects and are recommended for anyone on a statin, especially those on high doses. Probiotics can improve the gut microbiome which interacts with the human body in ways that are only in the beginning stages of understanding. The gut microbiome can be harmed by antibiotics and environmental agents that act to alter the microbiome. Probiotics can help maintain and restore the good bacteria that we depend upon for good health.